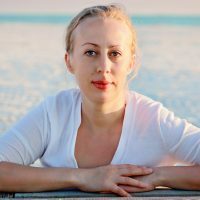 What is the hallmark of festive Russian gatherings? They always include a lineup of chopped salads! I can think of 10 varieties just off the top of my head! Each salad starts with some combination of potatoes, onions, and carrots. Whatever the base, it then gets different companions — like beets, herring, ham, apples, prunes, walnuts, cheese, or garlic. And finally, no matter what, everything is drenched in mayo or sour cream. This recipe emerged from my weekly habit of making chicken stock. I buy a chicken from a local Amish store, and then use it whole (not just the bones) for stock. As a result, the leftover meat I use in soups and salads — including this dish! While the ingredient combination may seem a bit odd to you (Pickles and dairy together? ), believe me, it works beautifully! Not to mention, the practice of using such ingredients goes back many centuries. In Russia, this recipe is similar to both okroshka and olivye. What are these dishes? Okroshka is a soup made from fresh and fermented veggies and herbs in a liquid of bread kvass, whey, or fermented milk. On the other hand, while okroshka incorporates fermented liquids to form a soup, olivye leaves out these ingredients in favor of a (less liquid-y) salad. However, it is made with similar veggies. And of course, plenty of mayo, too! 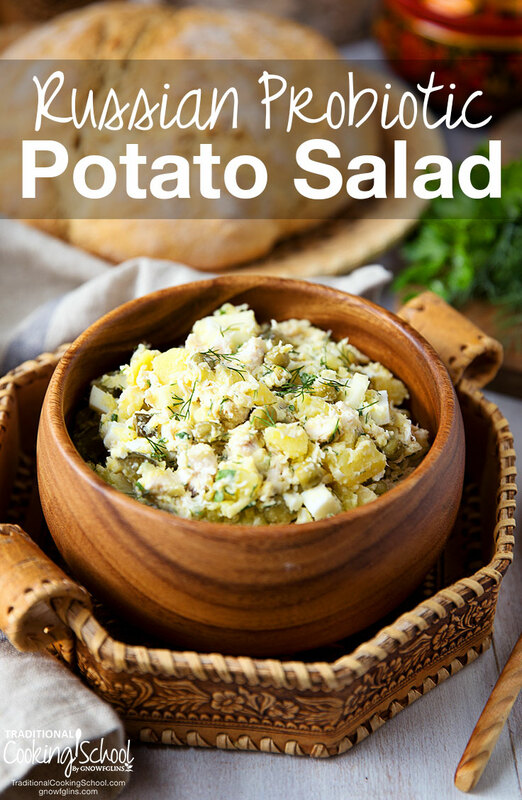 I've combined these concepts to make this probiotic potato salad. Make it a meal of its own, or serve it with a cup of soup and crusty bread! It's even perfect baby food. Just remember — chop everything finely and then omit the horseradish and pepper. My now 14-month-old started eating it when he was 10 months old. Make this salad a meal of its own, or serve it with a cup of soup and crusty bread! While the ingredient combination may seem a bit odd to you (Pickles and dairy together? ), believe me, it works beautifully! Then, in a small bowl, whisk the dressing ingredients well. Leave for a couple of hours, or overnight, for flavors to develop. Want to learn how to make your own cultured and fermented ingredients, like pickles, kefir, and sour cream? Then check out either our Cultured Dairy and Cheese or Lacto-Fermentation eCourse, or both! 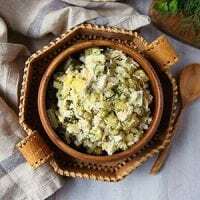 Have you ever made a probiotic potato salad? Do you enjoy Russian cuisine? This post was featured in 60 Easy and Nourishing Picnic Recipes and 92 Nourishing Grill & Barbecue Dishes, Drinks, & Desserts. So, by adding in some brine from fermented pickles you now have fermented potato salad?